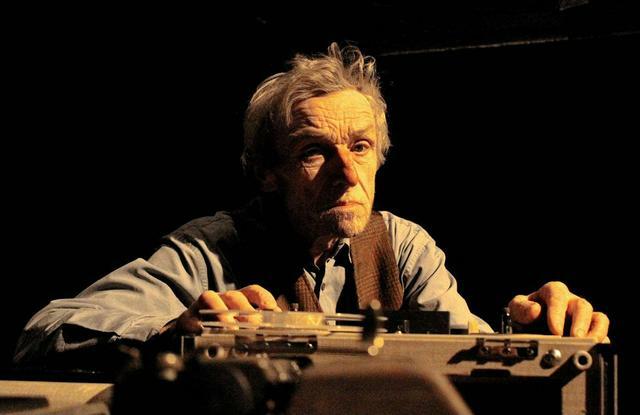 The production of Samuel Beckett’s Krapp’s Last Tape, performed at the Theatre Passe Muraille, is truly a wonder. A perfect stage for a one-man play, actor Bob Nasmith shines. Like the beacon of Canadian theatre he is (if it’s not too overblown to say), Nasmith commands the stage with the gravitas of person and character that one can only glean from decades of work. The role of Krapp may not be sought after like Hamlet or Macbeth, but Nasmith performs it as a pinnacle of a life’s work. The reflective nature of the material aids in setting that pensive and substantive mood. Theatre Passe Muraille is the perfect setting for a show of this nature: intimate, comfortable, and yet still holding the audience separate enough that they can get a little lost in thoughts of their own. Mounting a play of Absurdist Theatre, such as this, is an interesting choice, as you may land yourself with a divided audience. There are so many nuances to making absurdism successful, and how the play is received may vary from show to show. In the performance I was privy to, there were a few moments of intended humour that didn’t quite land. However, Nasmith was able to push those moments beyond asking for comedy and lead them into thoughtfulness. There were moments where the audience seemed a little unsettled, but overall the reception was warm, and the final curtain was met with breaths of awe and cascading applause. The design aspects of the show were an absolute hit. The set is perfect, with a deliciously battered old desk, decades-old hardback dictionary, and gorgeous tape player. Some accessories seemed out of place, however, which seemed to throw a shadow on the rest. I was especially intrigued by the use of the space of the stage- Nasmith’s movements were choreographed so it really did seem like we were sitting with him in his living room. The show also made use of the backstage space for some sound cues, which was fascinating. Overall, while not perhaps to everyone’s taste, spending my evening watching Bob Nasmith perform Beckett’s Krapp’s Last Tape was not an evening I’ll forget in a hurry. The play is so gentle, funny, touching, and reflective, and I would definitely recommend it to my peers, theatre-philes and newcomers alike.